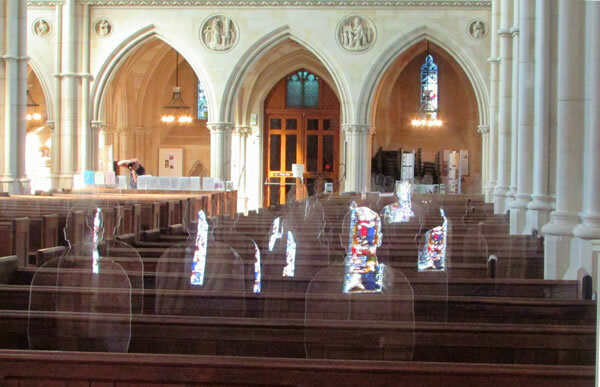 On Thursday 10th May 2018 transparent silhouettes took their position in the pews of Arundel Cathedral and nearby St. Nicholas Church to honour the fallen listed on their own local war memorials. 93 silhouettes were placed in both landmark locations to depict the shadows of soldiers left absent in the wake of the war. Following the overwhelming public support for the There But Not There campaign, that saw ghostly figures of WW1 ‘Tommies’ appear all over the UK; the Armed Forces Covenant Trust Fund has pledged £2 million to drive local community support. Community and faith groups can apply for Micro funds to host their own community owned silhouette installations. The silhouettes, different in shape to the standing Tommy, are designed to fit into seated spaces and were inspired by an art installation by Martin Barraud at Penshurst Church in Kent in 2016. The installation at Penshurst Church included fifty one silhouettes, one for each name on the local Penshurst war memorial. It is hoped that communities will honour the fallen on their very own local war memorials, by placing a silhouette for every man that fell in local community spaces. The silhouette installation at Arundel Cathedral and St. Nicholas Church will be present for members of the public to visit between now and Armistice Day. 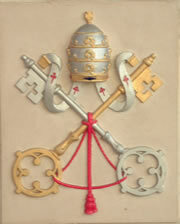 Other silhouette installations can be seen at Gurdwara Sri Guru Singh Sabha, Southall, Palmers Green Mosque, Palmers Green, St. Margaret’s Church (nicknamed The Marble Church), North Wales and Belfast Royal Academy, Northern Ireland. Alongside the community silhouette installations, members of the public are being encouraged to buy their own 10”/25cm version of the Tommy to remember their own relatives. The money raised from the sale of these commemorative figures, which are made by military veterans, will be distributed evenly between The Royal Foundation, Walking With The Wounded, Combat Stress, Help for Heroes, The Commonwealth War Graves Foundation and Project Equinox: Housing Veterans. The perspex Tommy figure of a World War I soldier is also available to buy at the Cathedral Gift Shop, priced at £29.99 each. but to win this peace for all. Please find enclosed a photograph taken by Ian from Yapton Cottage Gardening Society. It was entered in their competition for people of Arundel. Ian had hoped to capture the reflections of the lovely stained glass windows in the Perspex Tommys at the Cathedral. Thought it would be of interest for the Winter Parish Proclaimer.